Designing a home theater system is no easy task. In most of our jobs, we find the most common mistakes have to do with the screen. Generally those problems have to do with display size, but we also find screens that aren't prepared to handle ambient lighting or that clash with the rest of the room’s décor. In this blog, we look into the two most important factors you need to take into account when choosing a screen for your home theater. 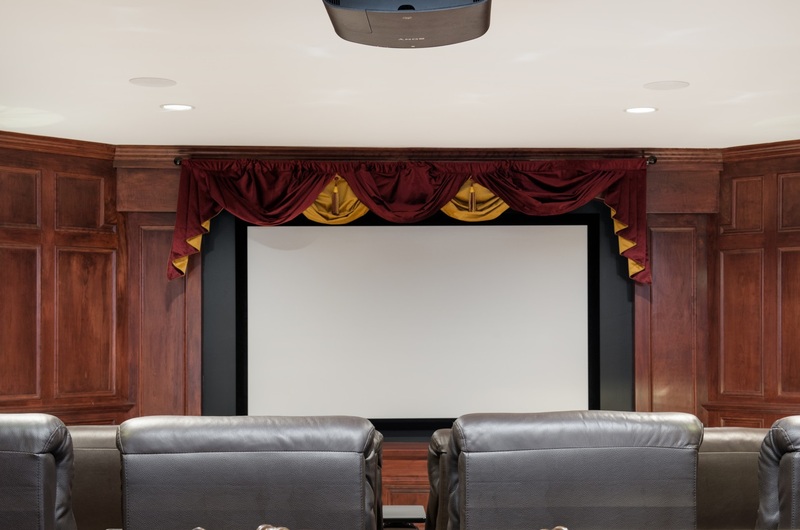 Size Often the main reason our clients opt for home theaters systems is for the big-screen experience. We can't blame them; the bigger the screen, the easier it is to immerse yourselves in your favorite movie. But if your screen ends up being too big for the room, it’s going to end up ruining your view. Your size will come down to the room’s height and length. When it comes to height, you can’t just measure from the floor to the ceiling to see how big your screen should be. Your screen will have to be at eye level for optimal viewing, so it has to be small enough to be raised a few feet off the ground. Your room’s length will come into play when deciding how far you should sit from the screen. A general rule of thumb is that you should multiply your screen’s diagonal measurement by 1.6 to figure out your viewing distance. If you have a 74-inch screen, you need to be sitting at least 9 feet from the screen to avoid pixelation or having to strain your eyes to follow the action. The second thing you need to consider when choosing a screen is the type of material. This primarily has to do with the amount of ambient lighting in the room. White screens are ideal for theaters that can be completely isolated from light. If your theater is in a room where ambient lighting is inevitable, you should opt for black or gray screens like the Slate from Screen Innovations. These screens are designed to deflect light not coming directly towards them. You should also decide whether your room could benefit from a perforated screen. Don’t worry; that doesn’t mean it has actual rips. Perforated screens have tiny holes, which don't affect image quality, so you can place speakers behind them. This is a great option for theaters with size or design limitations. Hide speakers behind the screen to get quality surround sound without the bulky equipment. Are you wondering which screen would be the best option for your theater? The experts at Lelch AV not only help you choose the best option but can also help you figure out if your space could benefit from a multi-screen installation. If you want to learn more about the best screens on the market or home theater design in general, don't hesitate to call us at (612) 353-5087 or fill out our online contact form.